Work and life in general got the best of me again. Here's what I promised in my FOTH 24 post. This rare comp was an interesting way to discover 60's songs with sitar on them. If the name doesn't ring a bell, it's quite normal: Volume One was the only one ever published. This is in fact the precursor the well-known "Psychedelic Sitar Headswirlers" series. The cost of vinyl pressing proved to steep for Nava Rasa Records and the length of these songs also fitted better on CDs. 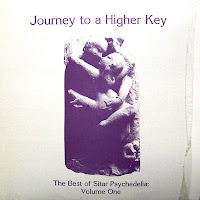 Journey to a Higher Key was only ever issued as limited edition of 300 copies. As you can see, my musical director has a rather unusual plastic fetish. Despite the LP being MINT, there's a fair amount of surface noise, which proved too much trouble to remove as the most of the songs have a very gentle volume. Surface noise to music ratio was too low. This comp gave me leads to Okko Becker "Sitar & Electronics" and the Rascals' "Once upon a Dream" LP… Time well spent. First track is one of these "Wodunnit" songs or how to surprise your friends with musical trivia: This is Linda Ronstadt's first band… a long way from her hot pants and good ol' Rock'nRoll days! Ananda Shankar led me down the path of period Indian and Bollywood sounds, with some very interesting finds. I left Bobby Callender in Sitar-Exploitation heaven and Gabor Szabo got stuck in the fake Psych-Jazz category, not quite the type of songs I had in Mind for FOTH 24. I had to drop Hand Gjort (Hand Made in Swedish), because of the length of the song and I also couldn't locate a copy of the Album (one of the most sought after item in Folk-Psych)… If you have a rip off it, I'll be grateful if you could drop me a comment with your email or a Download link. All comments are moderated and I won't publish anything with your email addy. Thanks in advance. Enjoy your sitar-laden psychedelia here. Thank you for this very rare item! Thanks for the links & comments. We have more surprises in the pipeline!